There are now several different types of aerodynamic helmets available to triathletes and time trialists. With so many choices, finding the right helmet for you can be difficult. I want to start by saying that I don’t have the magic answer when it comes to selecting the right aero helmet. I’ve spent a lot of time performing aero testing (in a wind tunnel and velodrome) and as the saying goes, you often leave with more questions than answers. 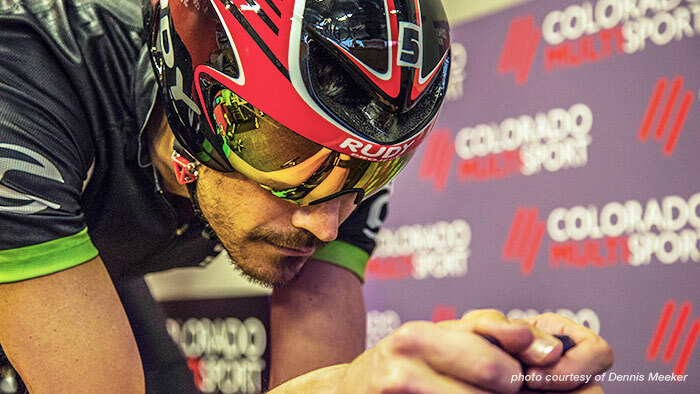 In this piece, I’m going to give you a bit of the science behind why you should wear an aero helmet and also some tips I use to help athletes select a helmet when testing is not an option. Put simply, you train to become better at moving forward. You can use equipment to help you move forward at greater velocities for a given effort. I commonly refers to this as free speed since you move faster, or more efficiently, without a gain in fitness. Free speed, maybe not monetarily speaking, is in full effect when we look at time trial events (I view a triathlon as a time trial event). Any and every piece of equipment is and should be selected to minimize resistive forces. For this article, I will focus on the helmet, but first a bit of the science behind aerodynamic drag. When we talk aerodynamics, we normally talk about it as aerodynamic drag, which is measured in grams. Drag is the the force that acts on an object to resist forward motion. Roughly 80 percent of the overall resistance effecting the rider when in motion comes from aerodynamic drag. Therefore, we can make it easier for cyclists to produce significantly higher velocities at the same power output by reducing aerodynamic drag. There are several types of drag forces, but to keep it simple, I will focus on two. This is when air compresses (high pressure) at the front-facing surface of an object creating a low pressure area behind the object. This disrupts laminar flow around an object causes the air to separate and become turbulent, increasing drag. This type of drag is caused by the shear stress along an object. Put simply, it’s how the surface texture impacts airflow along the object. To minimize pressure drag, you can minimize your frontal surface area and improve the shape of the object. You can minimize frontal surface area in cycling by lowering your torso angle, head, and narrowing your shoulders and arms. Once your bike position is optimized, you can use equipment and technology to do the rest. Unfortunately, your head is a very poor aerodynamic shape. Cylinders in general are poor shapes when it comes to reducing drag. You can improve the shape by using airfoils to control laminar flow. You will see this with bicycle tubes or in this case an aero helmet. In instances where an airfoil cannot be used, adding texture to poor shape, such as a golf ball or human arm, increases the turbulent boundary layer, creating an airbed allowing the continuation of laminar flow. This is why a golf ball has dimples and time trial suits have varying textures along body segments. The problem with having a lot of experience testing athletes in the wind tunnel or velodrome is that you get to see first hand that typical rules of thumb don’t apply to everyone. A helmet that tests well on one athlete tests poor on another. Helmet positioning can also fool us. I’ve seen where the helmet that looks the best and meshes nicely along an athlete’s back actually tests slower than others that don’t. I’ve also seen where an athlete breaking what is considered an aero rule of not pointing the tail of the helmet upward is their fastest position. There are so many variables to account for when determining the best helmet for an individual and the only way to truly know is to test. Most of us are not going to have the luxury of going to the wind tunnel to perform aero testing, but if you have a power meter, there are some field tests you can do on your own. One of the more recent and popular methods is to use the “Chung Method”, developed by Robert Chung. While this takes some time, and some very particular needs to perform this test, it can be done completely on your own. Additionally, this test is very good not only for testing a helmet, but also for position changes as well. Field tests take a lot of time to be done correctly, but you can also find big time savings as well. Aero helmets are the most cost effective pieces of equipment when it comes to better aerodynamics. Having the right helmet, along with optimizing your position overall, can save you minutes in your next race. Take the time to consider your options, and perform your own test to confirm your choice.